Block Keeper is a cross platform desktop cubing timer. 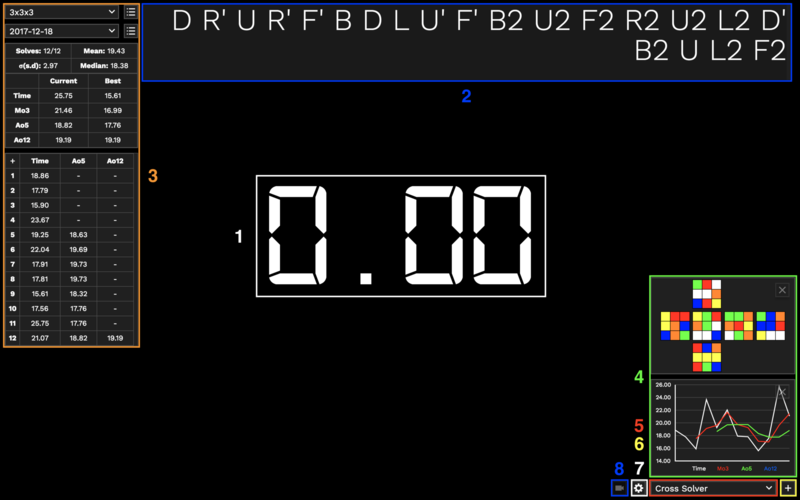 Block Keeper provides an event based session system with an elegant interface to provide relevant statistics and tools for speedcubing. If you encounter any bugs, issues or want to suggest any improvements, please let me know so I can make Block Keeper even better. You can contact me on Twitter [@dmcneil_](https://twitter.com/dmcneil_) or email dallas@dallasmcneil.com. Block Keeper uses Electron and should run on all supported platforms. Run Block-Keeper-Setup.exe to install Block Keeper. Block Keeper is installed in Users/YourName/AppData/Local. Save data and preferences are stored in Users/YourName/AppData/Roaming/storage by default. You may need to enable hidden folders to access these folders. Block Keeper is a standalone application and can be run from anywhere. You can place Block Keeper.app wherever you want (Applications folder is recommended). Save data and preferences are stored in /Users/YourName/Library/Application Support/Block Keeper/storage by default. Block Keeper can be launched through the blockkeeper AppImage executable file. Save data and preferences are stored in $HOME/.config/Block Keeper/storage or $XDG_CONFIG_HOME by default. Block Keeper will check for updates automatically at startup and will download any new versions. When Block Keeper is closed the update will be installed. Scramble: Displays a scramble for the current event and solve. Click to set the scrambler or a list of custom scrambles. Use left arrow to view the previous scramble or the right arrow to view the next scramble. Edit session: Toggles session options, allowing you to change the name of the current session, create a new session, delete the current session, transfer the current session to a different event or remove all records from the session. Solves: Number of valid solves (not including DNF solves) over number of solves. Mean: Total time of all valid solves over the number of valid solves, a mean of all valid solves. Median: Middle time of all valid solves in order. Table of best and current solves in session. Expands to present best and current time, Mo3, Ao5, Ao12 and Ao100. Clicking any results will present the list of times and scrambles used to generate the result. Clicking the label will present a list of all results, e.g click Ao5 to see list of all Ao5's. Records table: Ordered table of records presenting times of solves. A + on the end of a time indicates a +2 time penalty which is already added to the time and a DNF indicates a DNF penalty. Ao5 and Ao12 times are composed of the solve adjacent including the previous 4 and 11 solves respectively. A - indicates that there are not enough solves to calculate a Ao5 or Ao12. Clicking a time will present the scramble used, date created, full time, result and an editable comment for the solve with options to change the penalty or delete the solve completely. Clicking any average results will present the list of times and scrambles used to generate the average. NOTE: On MacOS, the CTRL key is replaced with the Command Key. The timer is inactive between solves and will present the time of your previous solve. Activating the timer and beginning a solve is different depending on a number of factors. By default, the space-bar is the timer key. By pressing and holding the space-bar down the timer will turn red. Releasing the key before it has turned green will cancel the timer. When the timer is green, it is ready. Releasing the space-bar will begin the timer and your solve. An alternative is to use split keys to operate the timer. By default they are Z and / but can be changed in preferences. Pressing and holding each key will show an indicator on the left and right side of the window. Once both keys are down, the timer will turn red. If one or both keys are released before the timer turns green, the timer will cancel. Once it turns green, releasing one or both of the keys will begin the timer and your solve. With inspection enabled, pressing and holding the timer key(s) will turn the timer immediately green. Upon releasing the key(s), inspection will begin. The timer will turn yellow and countdown from 15 to 0 seconds. With inspection announcements enabled, after 8 seconds and 12 seconds have passed, a voice will announce the current time of the inspection. To end the inspection and start the timer, follow the timer procedure above. If 15 seconds pass before the timer is started, a +2 time penalty will be indicated and added. If 17 seconds pass, a DNF penalty will be indicated and added. This is in compliance with WCA regulations. Upon completing your solve, pressing any key (excluding the Escape key) will stop the timer. Your time will be presented and be added to the records table. Pressing Escape before the timer begins will cancel the timer. Pressing Escape while the timer is timing will stop the timer but set the result of the time to DNF. If the current event is blindfolded, the timer will have a few notable differences. Inspection will be disabled and at the end of the solve, you will be prompted to input the result before seeing the time. Default blind events have 2 splits. If enabled, time splits can be recorded. Pressing any key during the solve will not stop the timer but will store the time as a split. Multiple splits can be stored before the timer is stopped. For example, 4 time splits could be used in a 3x3x3 event to record the stages of CFOP. Block Keeper divides sessions into event categories. Selecting an event from the event dropdown will show a list of it's sessions below in a separate dropdown. All sessions created will be added to the current event. A scramble for the current event will also be shown. In this system, every session belongs to a specific event, keeping them organized and providing the correct scramble for every solve. Everyone chooses to use sessions differently, however, with this system it allows for many more sessions to be created and used effectively. As an example, you could create a session each day to record your times. You're free to use sessions however you choose. You may also create new events using the event manager, available next to the event select dropdown. A table of all the events will appear which allows you to modify properties of event, name and the scrambler. If an event is not enabled, it will not be shown in the event select, however it still exists and all of it's sessions are still kept. You cannot delete a default event, but you may disable it. Deleting an event will delete all of it's sessions as well. You could create a new event for a specific method, or training technique, e.g A '3x3x3 Roux' event or a '3x3x3 Cross' event. After enabling Video Record Solves in preferences, your webcam or attached camera will be used to record your solves. Upon starting the timer, the camera will begin recording, until the timer is stopped. There is also the option to record inspection and just after the solve. After a recording has been made, the video can be viewed through the video record button in the bottom right corner. The video can also be saved from here as a .webm file. IMPORTANT: Only the most recent solve is available to view and save. When you begin another solve, the previous recorded video will be deleted. If you want to view/save your solve, do so before you start your next solve. Tools offer additional visual information and functionality. After selecting a tool to add form the selection menu, click the plus button to add the tool. Multiple tools can be added. To remove any tool, press the cross button on it. Cross solver: Shows all cross solutions for the current 3x3x3 scramble. The color of the solution indicates the cross color and the colors of (UF) indicate which faces are the top and front in the solution. Distribution: Shows a histogram of times within the currently selected session, showing the number of times within certain ranges. Drawn scramble: Shows the current scramble for the current event applied to a solved puzzle. Some events such as Skewb and MBLD are not supported. EOLine solver: Shows all edge orientation and line solutions for the current 3x3x3 scramble. The color of the solution indicates the cross color and the colors of (UF) indicate which faces are the top and front in the solution. Event statistics: Shows a table of current and best time, Mo3, Ao5, Ao12 and session means for the current event. Event trend: Shows a trend-line of session stats within the currently selected event for best time, best Ao5 and mean. This shows your progress in an event. First block solver: Shows all left first block solutions for the current 3x3x3 scramble. The color of the solution indicates the cross color and the colors of (UF) indicate which faces are the top and front in the solution. Metronome: Presents a metronome which can be started, stopped and adjusted to a set tempo. This can be used while timing or not. Session trend: Shows a trend-line of record stats within the currently selected session for time, Mo3, Ao5 and Ao12. This shows your progress through a session. Split trend: Shows a trend-line of time splits within the currently selected session, if time splits are used. Record inspection: Include inspections and just after a solve while video recording. Video auto-save location: Automatically saves recorded videos to the specified folder. Leave empty to not auto-save. Display scrambles in lists: Include the scramble for a solve in any exported times. Timer start delay: Delay in seconds between keys being pressed and timer turning green and becoming ready. Time splits: Record a series of time splits. When pressing a key, the time split will be recorded instead of stopping the timer. Multiple splits can be recorded during solves and setup in event management. Announce best time: When best time for event is beaten, displays New Best Time! under timer and causes confetti to fall. Scramble text alignment: Set text alignment of scramble text to left, right of center. Background image: Specify a path to an image file which will be shown in the background. Image can be a .png and include transparency to the standard background. Optionally the Select Image button will present a dialog to find an image using a file browser. Custom theme colors: Specify the color of specific UI elements. All colors specified should be in hexadecimal form (e.g #FF0000 for red), rgb form (e.g rgb(255,0,0) for red) or rgba form (e.g rgba(255,0,0,0.5) for red at half opacity). If any values have been input incorrectly, the default theme (Dark) will be used. Data: Session data (not preferences) can be auto-saved in a different location such as an external drive. This is shown below. Load will switch the location and then load that data, replacing whatever data is currently loaded. Save will switch the location and then save currently loaded data to that location. If the location is inaccessible, the default location with be used instead. Block Keeper export: Exports all session data to a JSON file. Block Keeper import: Imports all session data from a compatible JSON file. This merges the data with pre-existing data. csTimer import: Imports session times, results and scrambles from a csTimer JSON file. After selecting the file, you will need to specify the event you would like to place each session under. The first time and result for each session will be shown to identify the session. Use the event select dropdown to choose the event to import the session into. Repeat this for all sessions. Thanks for using Block Keeper!